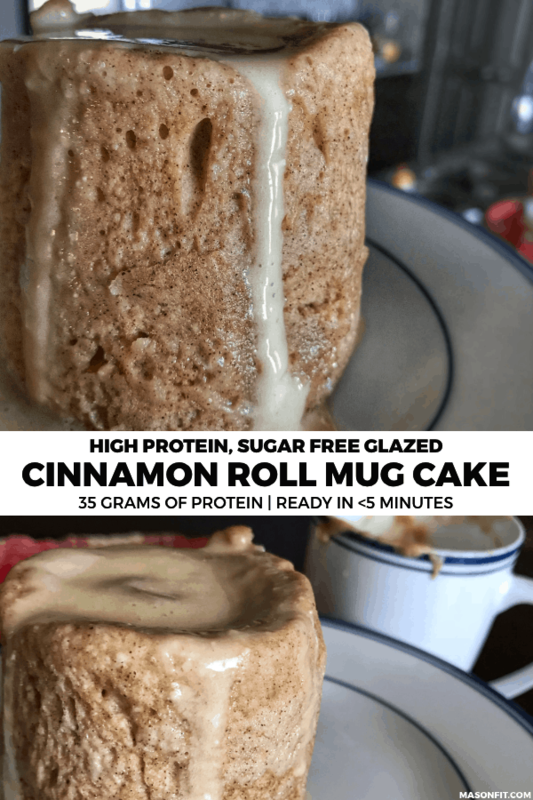 I’m sure you’re not all that curious about how I run my blog or interested in taking a quick peek behind the curtain, but I’d like to share something I learned while creating this healthy cinnamon roll mug cake recipe. Since I typically batch my cooking and recipe development days, I’m in the kitchen for 8-10 hours straight. As you can imagine, that’s too much time in the kitchen and way too many dirty dishes. And by the end of the day, I want to wrap the kitchen in crime scene tape and order pizza. What’s interesting, though, is that’s the same feeling I used to get after a long day of managing employees before I ran the blog full time. And I think it’s probably a common feeling that we all share from time to time. Coming home and cooking a healthy meal after a stressful day just isn’t on the menu for most of us. Which brings me to the point. I take pride in creating simple recipes that just about anyone can make without fail. 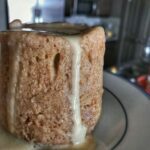 Yet, I tried to get a little fancy with this recipe after seeing A Virtual Vegan’s cinnamon roll in a mug. In her recipe, you make dough and actually roll it up. I thought I’d use my chocolate chip dessert pizza dough recipe and create something similar. But once I started, I simply thought it was too much work for a microwaveable treat. So I scrapped the idea and decided to go with a mug cake that could be mixed together in one bowl in a matter of minutes. The finished product tastes like a cinnamon roll, has great macros, and is super easy to make. And more importantly, it only adds one dirty dish to the pile. 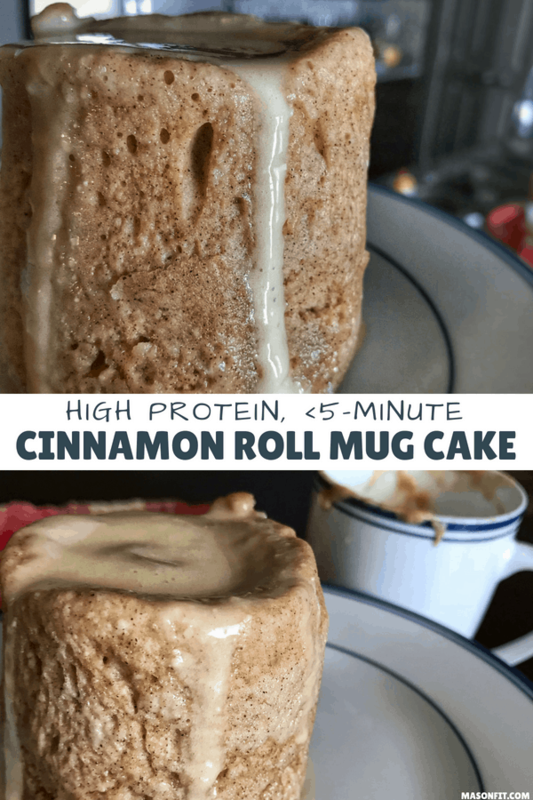 At first glance, this recipe has more ingredients than my typical protein mug cake. Most of the ingredients, however, are add-ins like cinnamon, sweetener, baking powder, water, and repeat ingredients for the icing. So don’t be afraid of the slightly longer ingredient list. The most noteworthy ingredient, or at least the most asked about, is the sweetener. You’ll notice the recipe calls for Swerve, which is a zero-calorie sugar replacement. 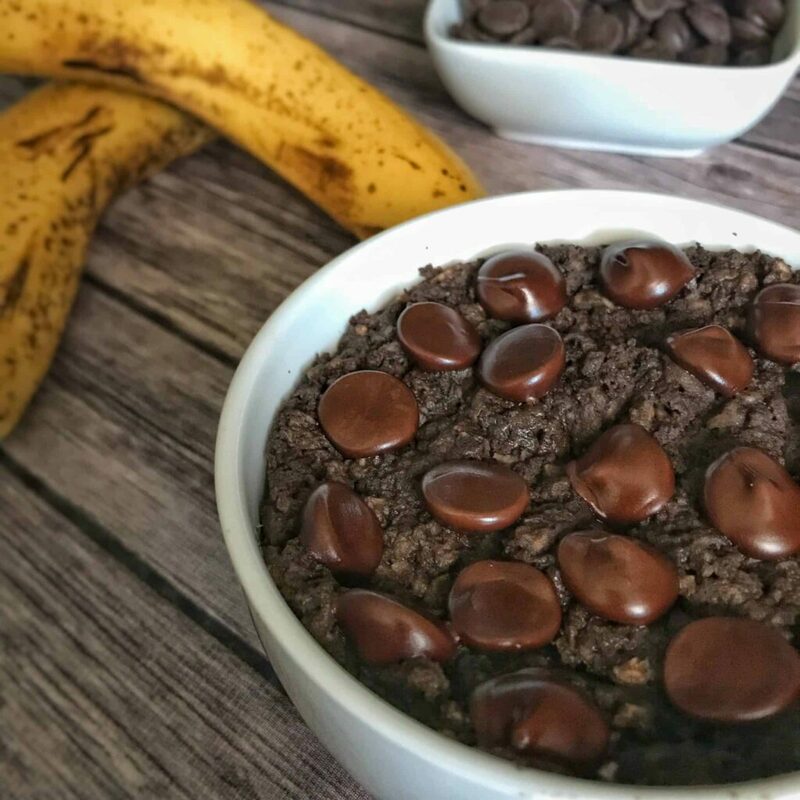 After using stevia for as long as I can remember, I started experimenting with Swerve in my microwaveable double chocolate banana bread recipe. So far, I’ve found it works a bit better in baked recipes than stevia. The short version is that Swerve is a sweetener that subs 1:1 for sugar and is made from erythritol and oligosaccharides (similar to the IMO syrup I used for the homemade quest bars). If you don’t have an issue with artificial sweeteners, I would highly suggest picking some of this up. The taste is definitely closer to sugar than stevia in my opinion. One thing you’ll notice in this recipe is that I mention both a granular and powdered (or confectioners) Swerve. I’ll touch on this in the recipe notes, but I use the confectioners blend exclusively in most recipes since I rarely use more than a few tablespoons. If you’re wanting to try Swerve out for some of my microwaveable protein mug cakes or brownies and recipes like my ultimate protein frosting, I’d recommend going with the Swerve confectioners blend. One final note about Swerve: Each serving has zero calories but 4 grams of carbs, which may seem confusing in the final macros. This is due to the partial calories in artificial sweeteners, fibers, etc. My advice when it comes to these things is to pick one way or the other—whether you want to count them or not—and just stick to that consistently across the board. In small quantities, it’s insignificant in the grand scheme of things. I use a whey concentrate or blend of whey and casein for all my protein desserts. I find that whey isolates and other ultra-filtered protein powders turn out tough and dry. If you have one of these types of protein, you may want to add a bit more fat or fat replacement. 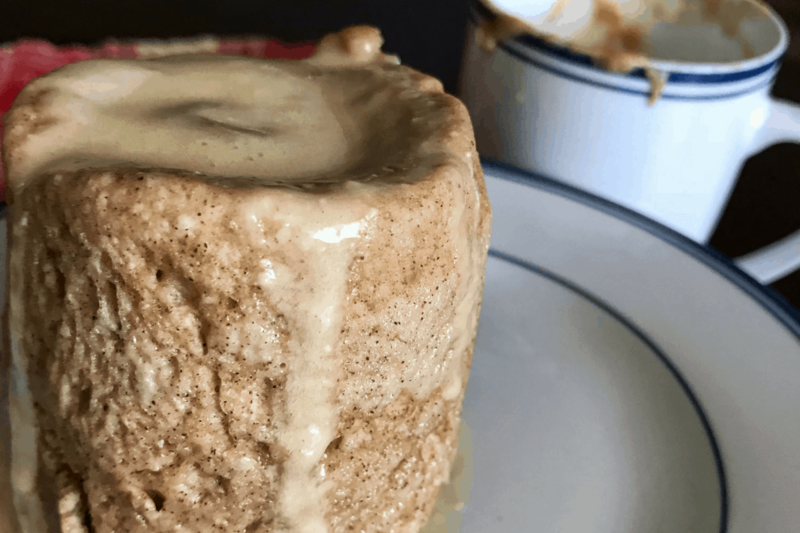 In the case of this healthy cinnamon roll mug cake, that could look like adding more of the light butter or even adding a bit of unsweetened apple sauce to keep the calories under control. As for specific brand recommendations, I use Optimum Nutrition Gold Standard Whey or Dymatize 100% Whey almost exclusively. That said, there are plenty of great brands out there. I always like to point people towards my article on finding the best protein powder. It will show you how to analyze cost per serving, quality, and other factors to make sure you’re getting the biggest bang for your buck. 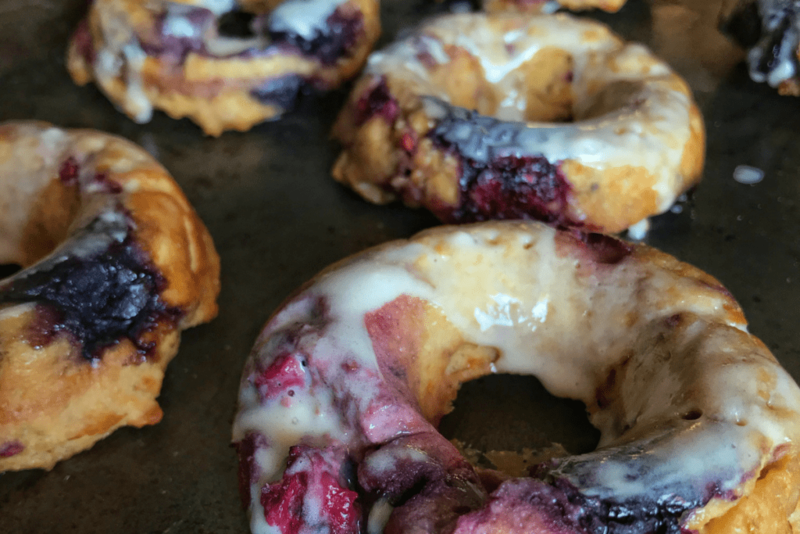 If you have a granular sweetener and you’d like to make a powdered sugar like the Swerve confectioners, here’s a recipe from my Cap’n Crunch Berries Protein Donuts that I used for the glaze. To make the donut glaze, blend the dry ingredients for 30-60 seconds. You can hand mix, but I’ve found it doesn’t reach the same level of powdered sugar-ness. Once you’ve got your powdered sugar replacement, simply mix with your choice of milk and stir. Pour or spoon the glaze on top of the donuts and give them 1-2 minutes to set. Okay, that’s about all ya need to know. 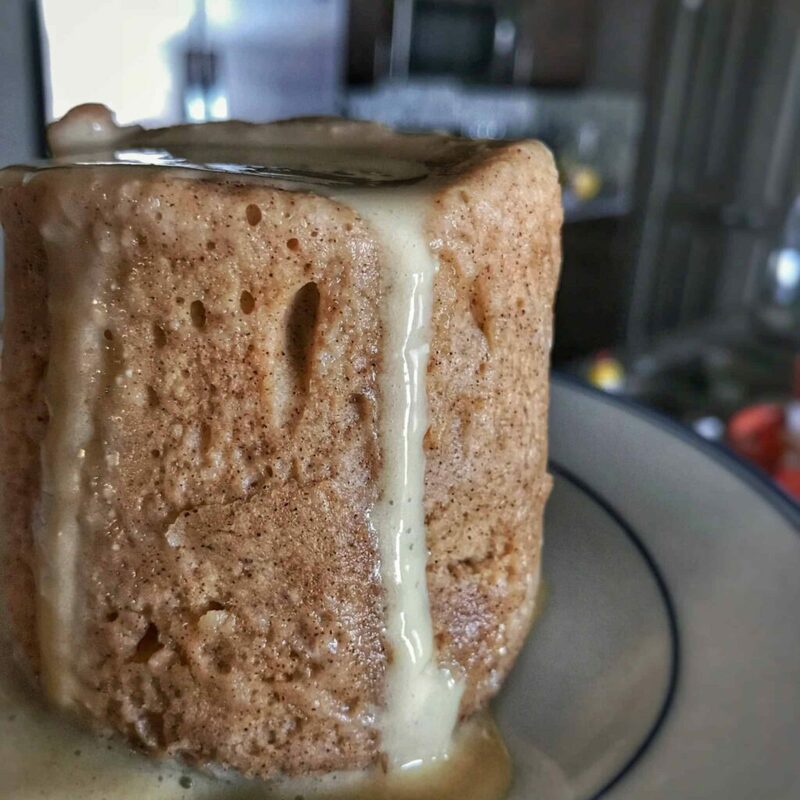 You’ll find the healthy cinnamon roll mug cake recipe below. If you make this recipe, I’d love to see your creation. Grab a photo and tag me on Instagram @mason_woodruff or join the Facebook group and share it with everyone. A high protein cinnamon roll fix that's ready in 5 minutes or less. Add the sticky sweetener, water, and butter to the dry ingredients. Stir well. Microwave for 60-70 seconds or until cooked in the center. Avoid overcooking, as the cake will get tough. While the cake is in the microwave, mix the icing's ingredients in a small bowl. Add this to the top of the cake once it's cooked. Enjoy! If you don't want to purchase both types of Swerve, I typically use the confectioners version exclusively. Since I rarely use more than a tablespoon at a time, they're relatively interchangeable. If you're going to make larger recipes where you may need an entire cup of sugar replacement, it's a good idea to stick to granular and powdered versions when called for. If you need a powdered sugar replacement for the Swerve, check out the donut glaze for my Crunch Berries Protein Donuts. That should keep you busy for quite some time on the dessert front! If you’re looking for something a bit more savory, you should take a look at my free cookbook for pizza lovers. It’s got 15 of my most popular high protein pizza recipes. You can check it out here or simply enter your info in the box below to have a copy sent straight to your inbox. These is one of my breakfast go tos! It’s quick and delicious! I’ve made several of your recipes now and I’ll make sure to post some results and tag you on Instagram you deserve all the credit everything Ive made is delicious and people are asking for recipes so I have guided them your way! Thank you so much for sharing !! Thank you, Devan! Can’t wait to see what you’ve re-created. This was so yummy! 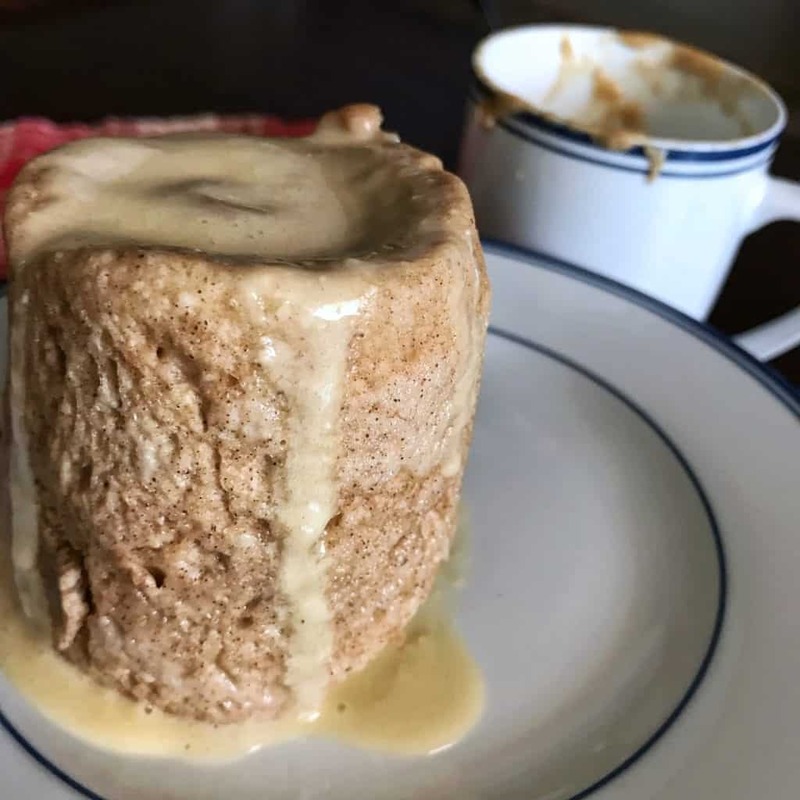 I was pleasantly surprised because I had tried to make a different cinnamon roll mug cake recipe before and that one was a flop. I had to modify this one to use what I had so I used PEScience Vegan Cinnamon Delight for the protein powder and I did not have Swerve so I used Pyure sweetener. I didn’t end up making the frosting because I already had some cream cheese frosting on hand. But the cake was moist and delicious and macro friendly! Thank you! This is seriously so good! I made it the other morning for breakfast. I am a sucker for a sweet breakfast, and since starting to count my macros I have really been missing all the cinnamon rolls, french toast, pancakes, and coffee cakes! But this one was an AWESOME replacement. I will make this when I need that sweet fix. I used Bowmar Nutrition PFC for the protein, and it worked perfectly!